It is getting very close. Are you ready yet?? Only two more days till Christmas!! EEK! ha In honor of Christmas I am sharing a Christmas layout that I made. I left it ready for some of the holiday photos I plan to be taking. 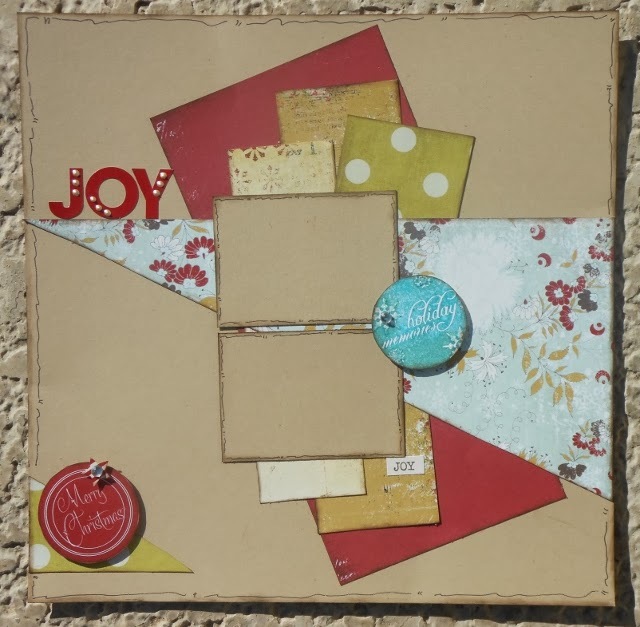 I made using a sketch from Brenda Ragsdale for the December DT challenge at Sketches4all. The challenge doesn't end until December 31st so you still have time to enter! I have a hard time showing this layout to you without photos. For some reason it just feels so unfinished without photos but I'm doing it anyway. I layered lots of fun papers from my stash onto the Kraft base. They are all from the Fancy Pants - Merry Little Christmas collection. I used the awesome watercolor stamping technique that I showed you HERE using the awesome Christmas Sentimentals - Jingle Bells stamp set. I went with a simple title of Joy using letter stickers from the same collection. I added some dots to the stickers using Liquid Pearl in Bisque. I doodled around the page and around the Kraft paper mats that are awaiting their photos.